Several agents have been used for the treatment of prostate cancer such as flutamide, galeterone, abiraterone and others; however, some of these drugs can produce some secondary effects. The aim of this study was to synthesize a diaza-bicyclo-naphthalen-oxiranyl-methanone derivative using some chemical tools. The structure of all compounds involved in this study was confirmed by spectroscopy and spectrometry data. 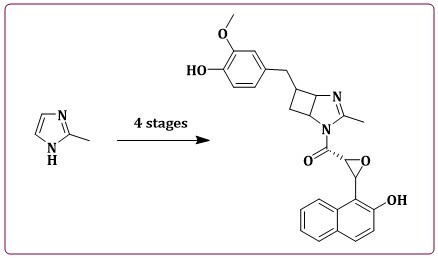 In addition, the theoretical interaction of diaza-bicyclo-naphthalen-oxiranyl-methanone derivative with the cytochrome P450-17A1 enzyme (3RUK) was evaluated in a docking model using some drugs such as galeterone and abiraterone as controls. The results showed that diaza-bicyclo-naphthalen-oxiranyl-methanone could interact with different types of amino acid residues involving 3RUK protein surface as compared to both galeterone and abiraterone. This phenomenon may be due to the differences in the chemical structure of compounds. All these data indicate that diaza-bicyclo-naphthalen-oxiranyl-methanone derivative could change the biological activity of cytochrome P450-17A1 enzyme which may be translated as good candidates for prostate cancer. Mohr P., Taylor, B., Newell, D. J. Phys. Chem. Reference Data. 2008, 80: 633.